Blogger is a popular blogging platform on the internet with loads of users updating their respective blogs with new content. Now you can publish and post on Blogger blog from iPhone with greater ease using BlogPress Lite app. 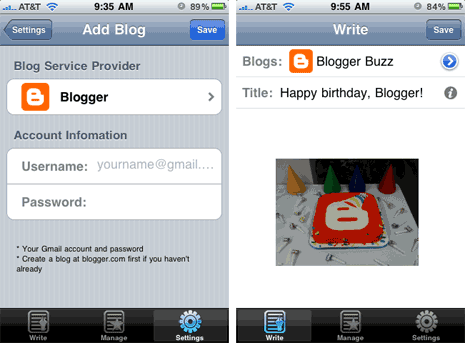 It is a free app for iPhone users to update their Blogger blogs on the move. 1. It has Rich-text WYSIWYG editing, image uploads, labels & settings. 2. It supports auto-save features as you type and blog. 3. It comes with support for Landscape editing mode. 4. Fully optimized for iphone experience. Join to get free & fresh content delivered in your inbox. Your email address is safe with us! Davinder Singh Kainth is a technology writer and founder of TothePC.com featuring tech tips and how to guides. © 2007-2013 TothePC - Content is copyrighted and may not be reproduced on other websites.